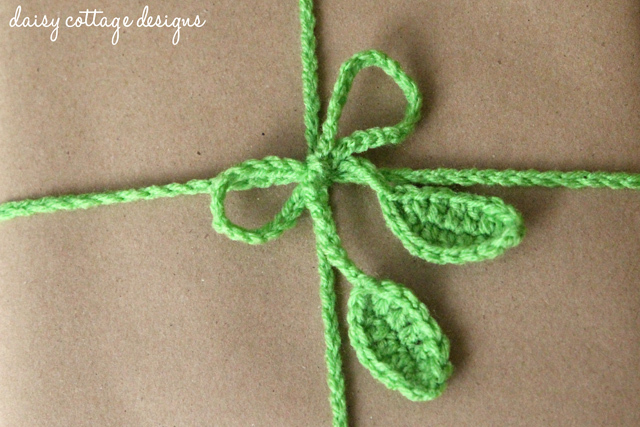 When it comes to crochet gift wrapping ideas, there aren’t too many around the web. But, when I go to a party, I know it’s nice to have a beautifully wrapped package to take with you. It’s so easy to just grab a gift bag and stuff some tissue paper in, but sometimes you just need to make a little bit more of a statement. 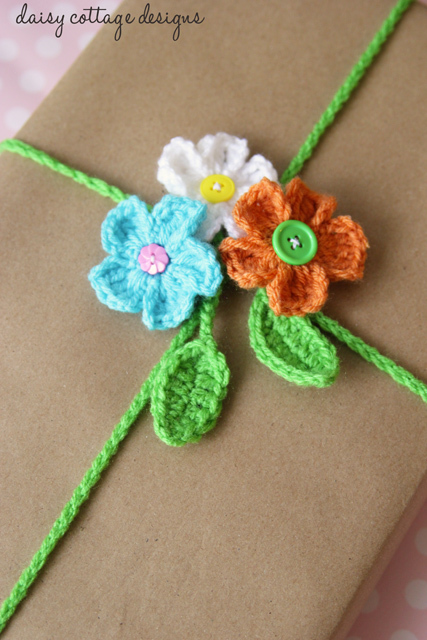 Do you have any of your own crochet gift wrapping ideas? If so, leave a comment letting me know your favorite way to wrap a gift with yarn! 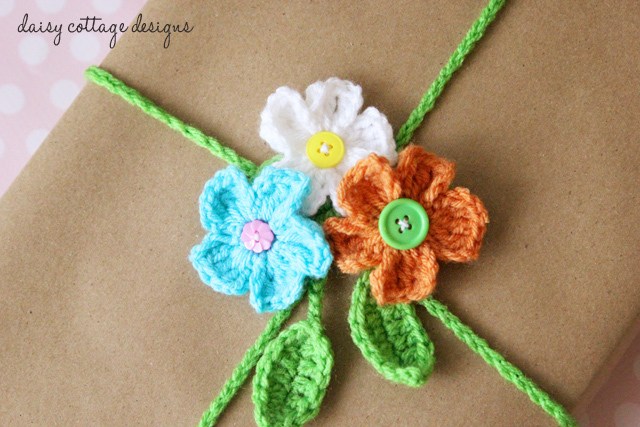 First, make three daisies from this pattern using an H crochet hook. Embellish them with buttons of your choice; I decided to put mine on lined alligator clips so that they could be used for hair clips later on. Now, you’re going to need to take a piece of yarn and wrap it around your package. This will allow you to see how long your chain needs to be. Make sure the yarn is long enough to tie in a bow. Cut the yarn and set aside for later. We’re going to make the leaf chain now. Round 2: You aren’t going to turn the work like you normally would; instead, you’re going to be working into the other side of the leaf. sc in the first stitch, hdc in the next, dc in the next 4 stitches, hdc in the next, sc in the next, sl st in the first sc. Don’t cut your yarn. Now, you’re going to chain until your chain is as long as the piece of yarn you set aside. After you’ve reached that length, you’re going to make another leaf so you will have one on each side of your chain. You will work this second leaf the exact same way as you did the first. Just note that when you work the second leaf, your ch 2 will be brought over the existing chain and then you will work the second side of the leaf. Now, wrap the yarn around your present. Tie the leaf chain in a bow. After that’s done, clip your flowers to the loops of your bow and chain that is going around your present. You now have a beautiful and fun present to give to a friend. Don’t forget to share your favorite gift wrapping ideas! Adorable, would love it if you&#39;d join my linky party, always lots of crochet inspiration too! hope to see you there…@ Craft Schooling Sunday! Love the elegant simplicity of it. I found your website thru Look At What I’ve Made. 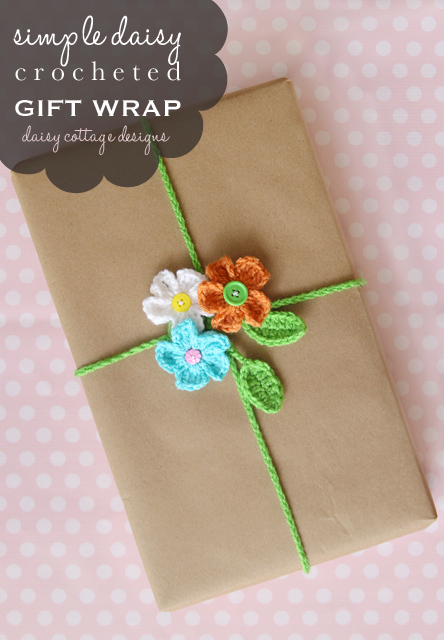 She featured your Daisy Gift Wrap, thank you so much for sharing ad I am looking forward to receiving your newsletter.